Profound Inner Peace does not come from fixing yourself up. It arises from the extraordinary discovery that you are already whole, from the knowing and living of who you truly are. Connecting to your essence supports and sustains you through life’s inevitable ups and downs. While self improvement programs are helpful, lasting peace comes from discovering your spiritual essence. The truth is that you are much more than you imagine yourself to be, far more so than you can talk yourself into believing. Your essence is not flawed. Deep inside you are already worthy and whole. If you really want inner peace let the desire to know your true self burn in you. Know that your spiritual essence is already, always present in you, even now, as you read. If, in your quiet moments, you experience a sense of peaceful presence, move into that experience even more. This essence, when truly felt, becomes a powerful flame that consumes your misunderstandings about who you are, fills you with profound inner peace and guides you towards your potential. If you yearn to live that which is most true in your life we invite you to contact us or join us in a workshop or retreat. This book offers meditations, mindfulness practices, self-inquiry exercises, and yoga poses that soothe your anxious feelings, open your heart and develop your mental clarity restoring your sense of innate goodness and increasing your contentment in life. We host two transformative retreats in Oklahoma each year, one in March and one in November. Retreats to be held at St. Crispin's Retreat Center, near Tulsa and Oklahoma City, Oklahoma. 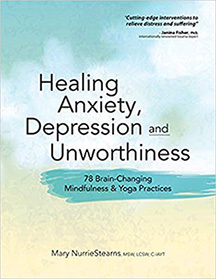 78 Brain-Changing Mindfulness & Yoga Practices: Transform your feelings of anxiety, depression and unworthiness into loving self-acceptance. A compassionate and practical workbook that provides a caring healing journey. 78 brain-changing practices help you focus on life-enhancing thoughts and actions, which leads to self-understanding, and living with meaning and peace. Interactive format with journaling prompts. Learning to take care of emotions. Tools for cultivating mindful contentment. Treatment notes for each chapter. Many of us have experienced a traumatic event in our lives, whether in childhood or adulthood. This trauma may be emotional, or it may cause intense physical pain. In some cases, it can cause both. If you want to practice the healing, contemplative practices of yoga, this book is for you. Yoga Mind, Peaceful Mind has 160 powerful, daily meditations that are filled with thoughtful, touching insights.